Wake Up Weekend is NOW! Wake Up Weekend is an annual grass-roots celebration of animal-friendly advocacy, art, food, education, music, philosophy, and religion in Grand Rapids, Michigan. Our mission is to demonstrate that compassionate living toward animals is an accessible, inspiring, inclusive, and holistic way for engaged human beings from all walks of life to live more intentionally for the good of all creatures–human beings, animals, and the environment. 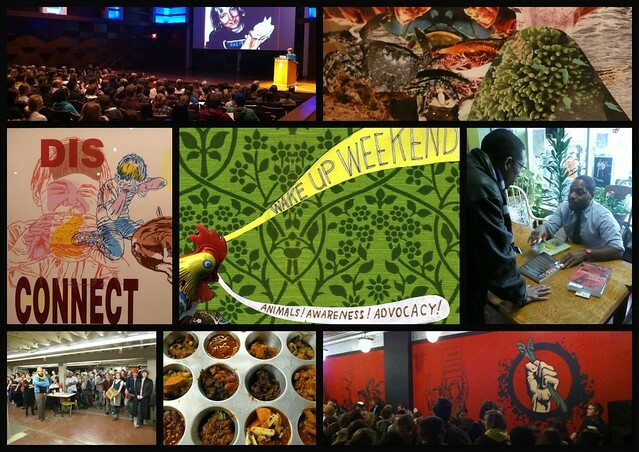 Through free and open public lectures, workshops, exhibitions and community events that bring the creativity and vision of activists, artists, chefs, philosophers, and theologians into unexpected and often bracing juxtaposition, Wake Up Weekend seeks to solicit the many but often hidden ways in which the exploitation of animals–an urgent moral issue in its own right–sustains other entrenched forms of oppression that we all stand against: global hunger, diseases of affluence, the exploitation of women, racial injustice, and environmental degradation. But if our culture’s exploitation of animals has negative repercussions for virtually every square inch of the order of things, then the wake up call to more compassionate living toward animals is also an invitation to the work of making all things new. We hope you’ll join us in this work! To increase the likelihood that you will, we strive to minimize barriers to entry. Our events are free, open to the public, and achieved through collaboration among a variety of individuals, institutions, organizations, and businesses that take a variety of perspectives on animal advocacy. Accordingly, Wake Up Weekend is less a single, unified event than it is a collaborative community of events in which different people with diverse outlooks and callings can exchange ideas, challenge one another, and rally together around a common interest. For this reason, not all advertised events necessarily reflect the views of all sponsors.